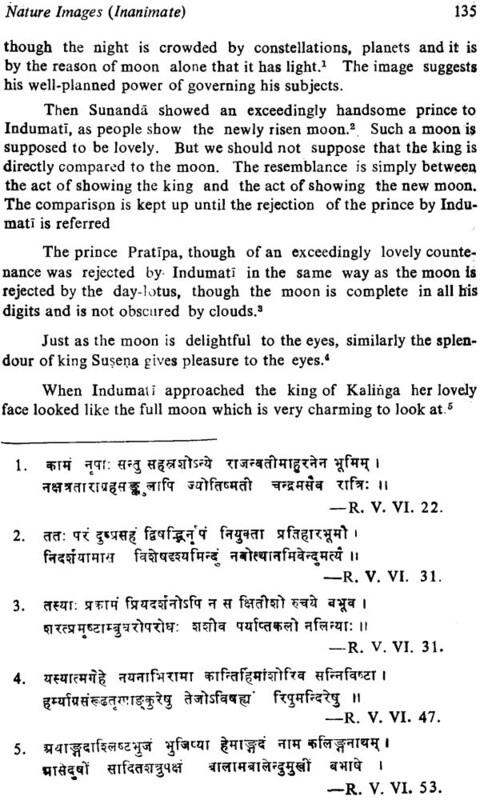 So far no research work has been attempted to the study of Imagery of Kalidasa. And no study of this poet is complete unless it analyzes the imageries which he employed in his works. The book is the first of its kind and deals with the subject in the most comprehensive and systematic way. It is divided into eleven chapters. Ch. 1 is introductory. 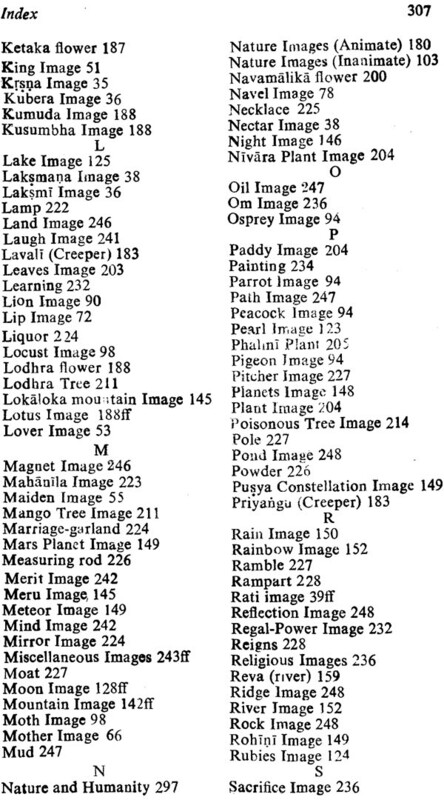 It analyses imagery, its contributory effects together with the classification of images. Chs. 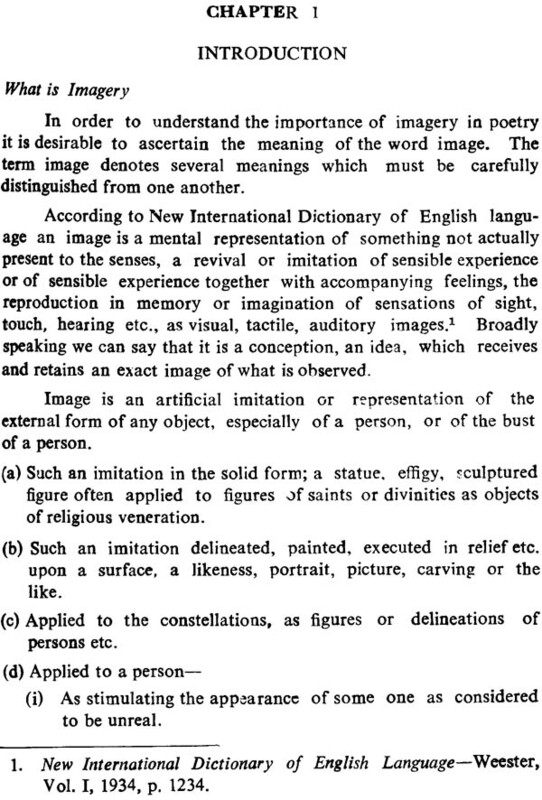 (2-9) that follow deal with imageries of different sort-divine, human, abstract and those derived from art, Architecture, religion and miscellaneous sphere of life. Ch. 10 deals with the critical appreciation of our poet's handling of the subject and Ch, 11 surveys the variety of imageries and analyses their ideological background. The book is documented with Bibliography and Index. 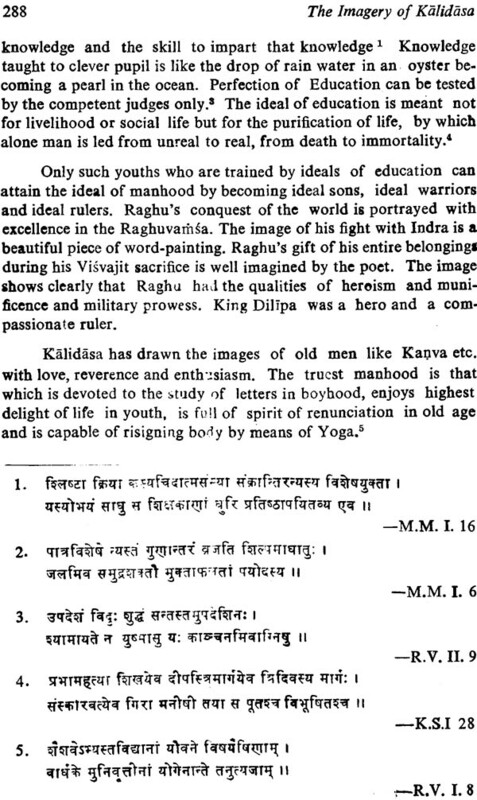 I am very happy to write these words by way of introducing to the world of scholars and students this work: The Imagery of Kalidasa by Dr. (Mrs.) Vinod Aggarwal, Lecturer in Sanskrit vivekanand Mahila College Delhi, Delhi University. For long time Kalidasa is being studied from different angles and by the scholars of the whole world but there are many aspects which still remain to be explored. 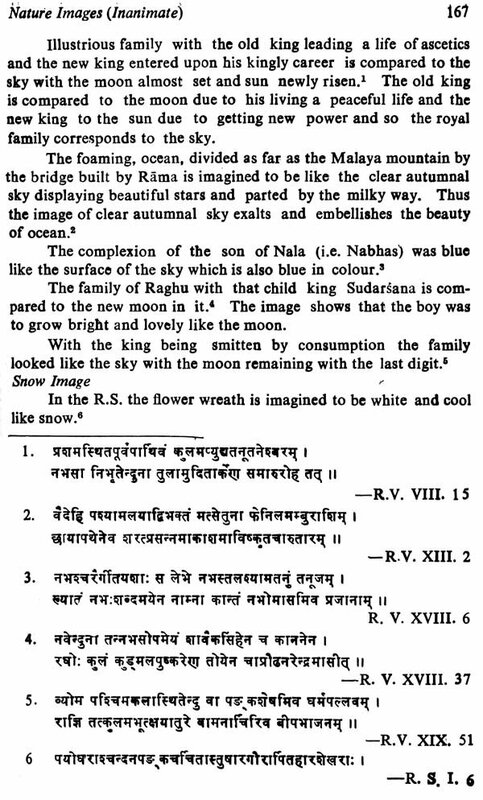 Mrs. Aggarwal worked on a very important aspect of Kalidasa that is imagery. Imageries are the life of any creative literature. A poet combines two elements in him. Pratibha Poetic genius and VyutpattiScholarship. Imageries are the outcome of pratibha the poetic genius. Pratibha has been defined and explained by two prominent critics differently. Bhatta Tota, and a renowned teacher of aesthetics Abinava Gupta, define it as a faculty of mind fully capable of imagining new ideas. 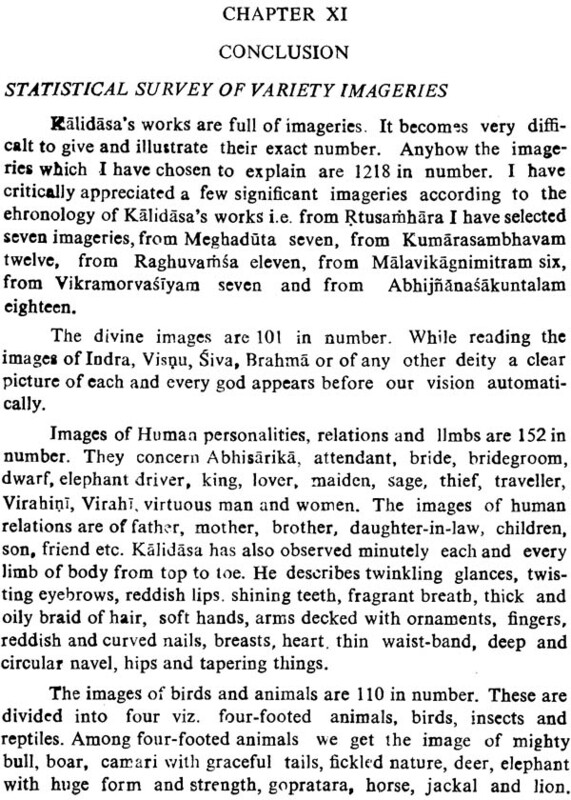 Dr. Vinod Aggarwal has been very successful in describing imageries in the works of the Lord of poets Kalidasa. She has offered very good interpretations at places. Her work is not mere survey of all that was available to her, for she has at times some suggestions to make. Her lucid style has made the work a very readable one. 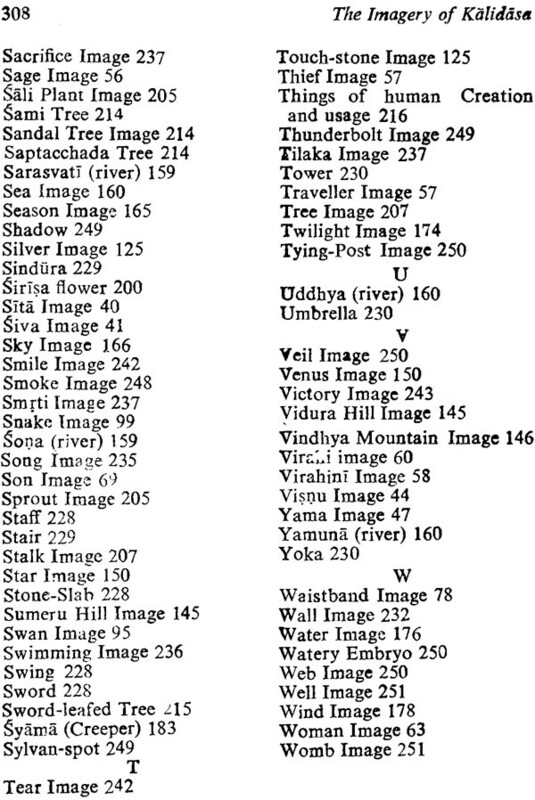 I have no doubt that the students of Sanskrit language and literature will find this work very useful. I appreciate DJ. (Mrs) Aggarwal for her fine performance in this work and wish her years of fruitful activities. 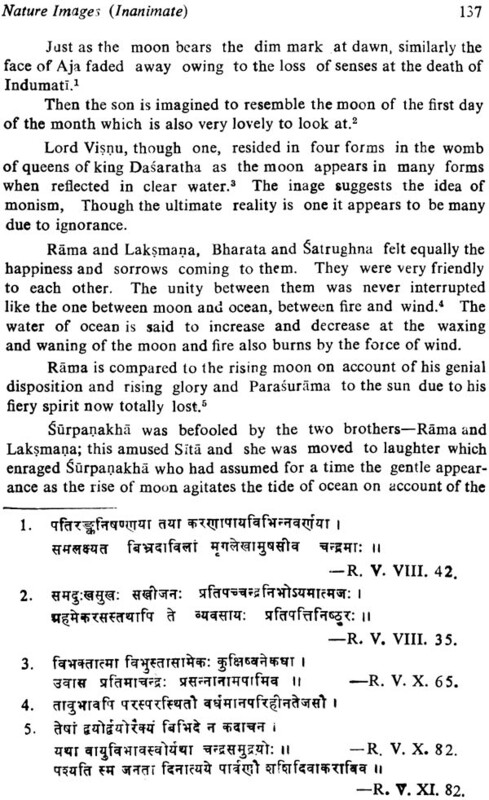 Kalidasa occupies a dominant place in Sanskrit literature. He has been rightly called the Kavikulaguru. 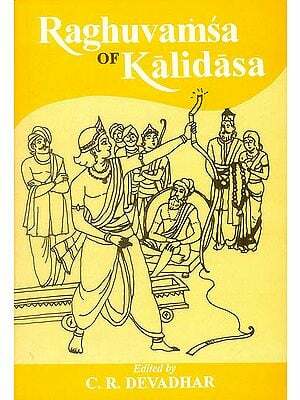 A lot of work has been done on Kalidasa from different points of view beginning from ancient time to the modern period. 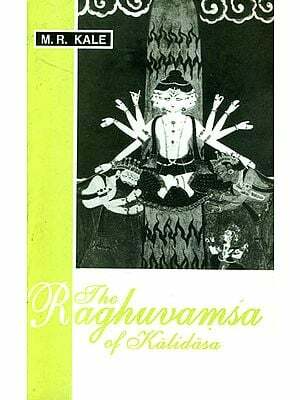 When we study Kalidasa, we find that all his works abound in imageries, whether it be a drama, a mahakavya or a lyrical poem. 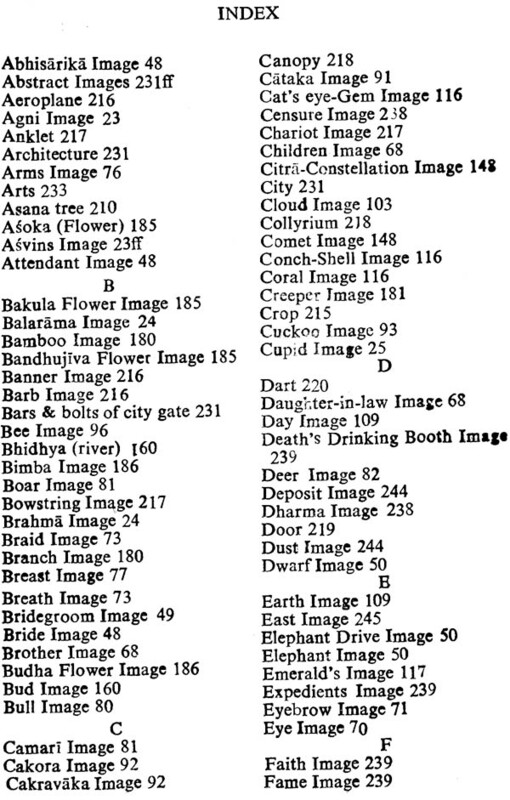 It would not be an exaggeration if it is said that each and every verse of Klalidasa contains more than one imagery and at times a diversified imagery in it. 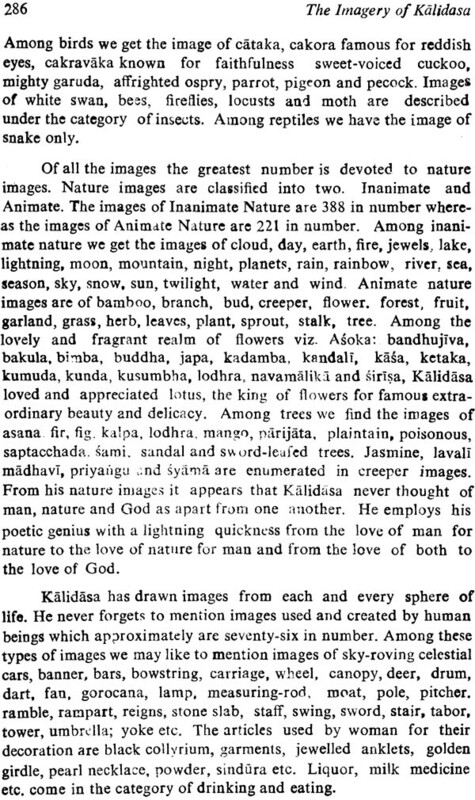 Kalidasa is famous for his similes and descriptions of nature. 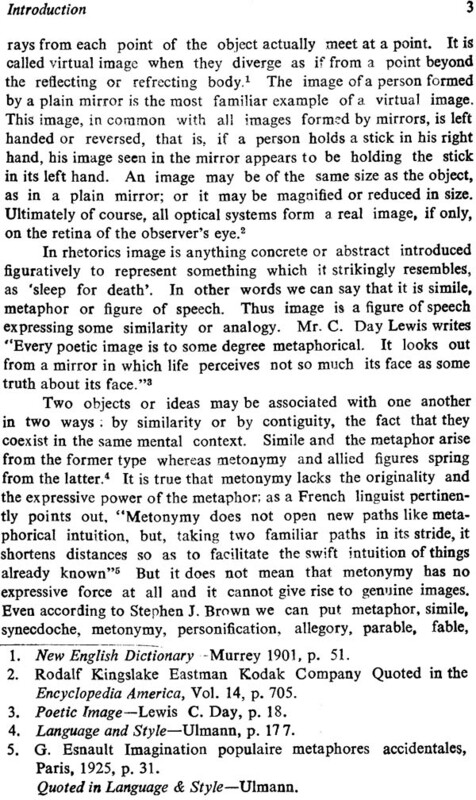 But his poetic excellences can be judged through his poetic imageries very well. 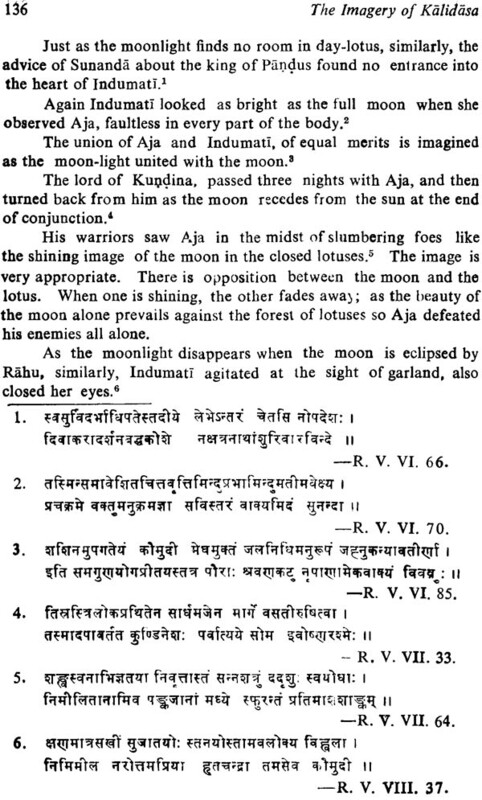 N J research work has been devoted to the study of the imagery of Kalidasa up till now except a monograph by L.S. Bhandari entitled the 'Imagery of Kalidasa'. I, therefore. 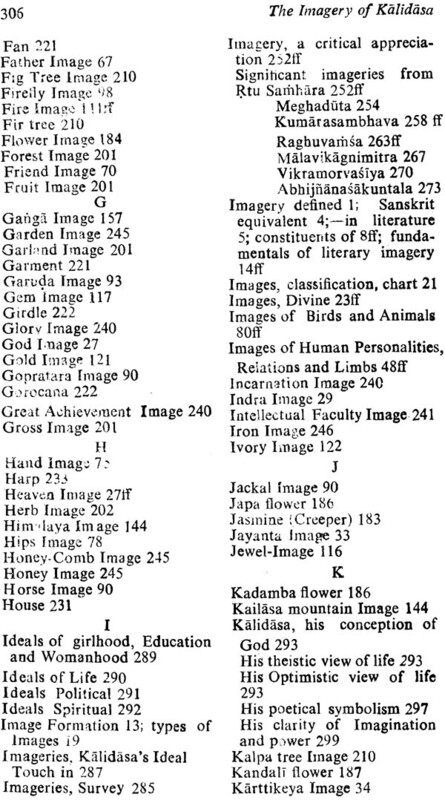 intend to bring out the beauty of Kalidasa's art by giving the equivalent term of Imagery in Sanskrit Literature and by analyzing imageries which Kalidasa employs in almost all his works. 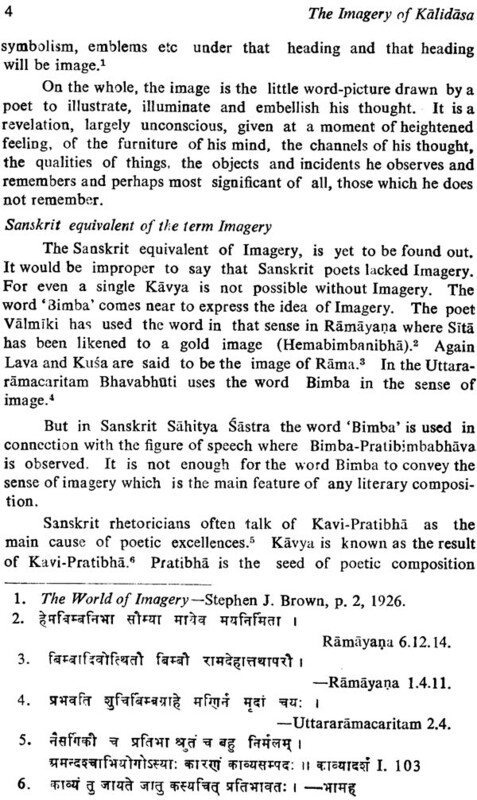 Sanskrit rhetoricians often talk of Kavi-Pratibha as the main cause of poetic excellence. 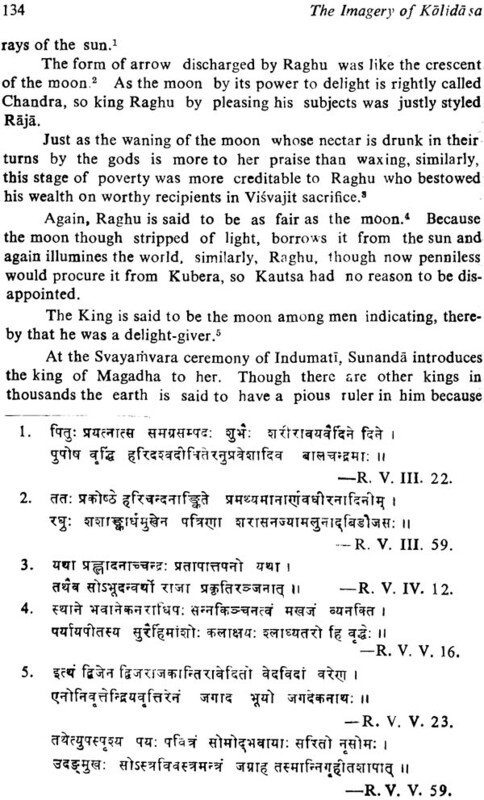 Pratibha is Kavitvabija. 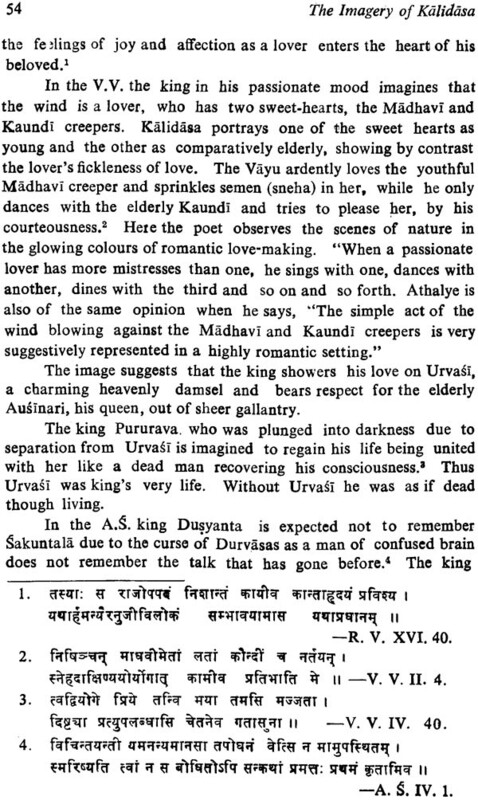 It is the Arthavastu that comes into the mind of poets in the form of the result of Kavi-Pratibha. Pratibha is that power of the poet which is capable of creating Apurva Vastu. The term Vastu here stands (or Imagery and its adjective Apurva suggests that the natural genius of a poet is in the use of novel imageries. 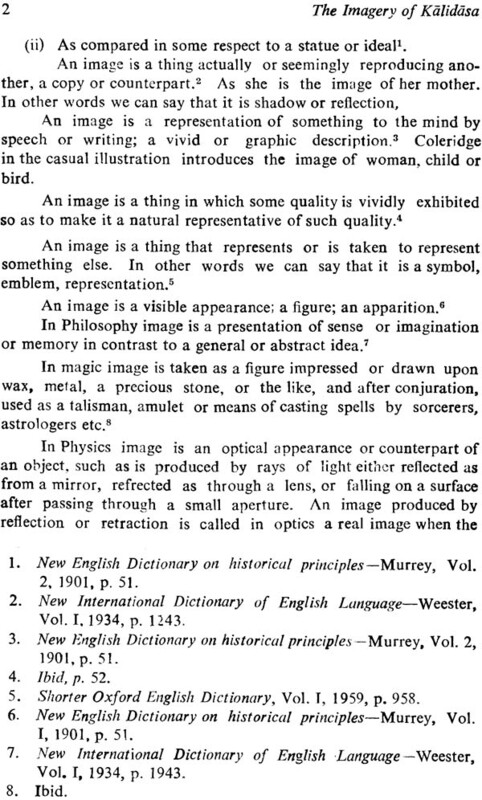 Thus it is the Vastu which is imagery in Western Literature. Every image bears evidence of the poet's sureness of Judgement and delicacy of taste-the music, the fulness, the aptness, the simplicity. 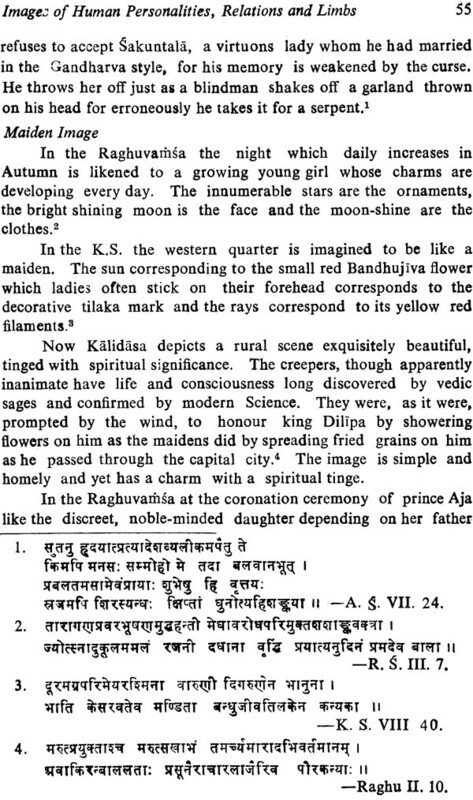 the purity and the sweetness used in Kalidasa' images could not be imitated by other poets. 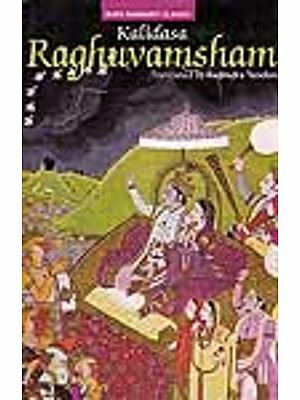 It is due to these qualities of his own that he could draw in the minds of his readers a vivid and graphic picture of what he wished to .ay and it is this power of expression which is called poetic genius (Kavitva Sakti). Thus we see that there was something truly great and divine about his inspiration and genius for he himself has said that extraordinary splendours do not spring from earth. 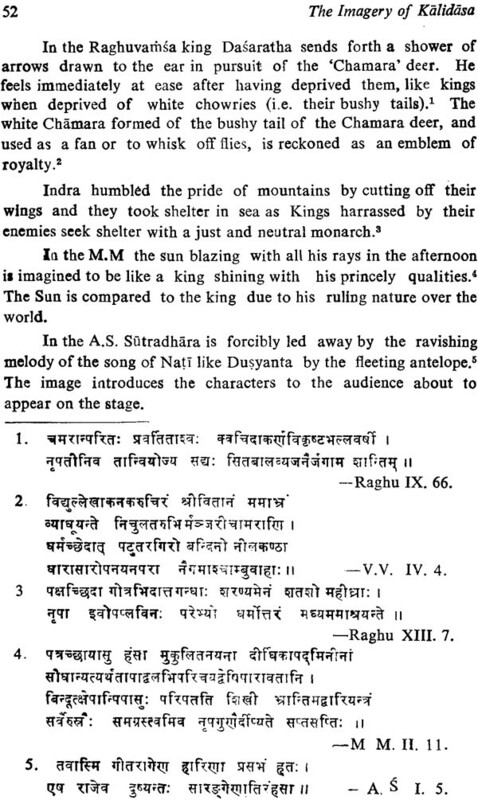 Thus the images which he sang are eternal and so Kalidasa's appeal to the Indian mind is bound to be perennial. At the very outset, I must express my deep sense of gratitude for Dr. B.M. Chaturvedi, Professor of Sanskrit, University of Delhi, without whose kind help, valuable suggestions, guidance and blessings this book would not have seen the light of the day. I am highly grateful to my husband Sh. V.N. Aggarwal and the members of my family who have encouraged and rendered possible help in giving the present shape to this work. I must thank Shri Sham Lal Malhotra, Proprietor Eastern Book Linkers, Delhi-7 for undertaking the arduous task of Printing and publishing the work with rare dexterity, promptness and skill.